Happy Tuesday, good people! I hope you kicked Monday's a$$! I've mentioned in an earlier post that my life is undergoing lots of change. In addition to landing a new job and a new pooch, I finally have a new last name! So I'd been going by my husband's last name socially for a while, but I'd made a commitment to myself that I'd have the name change stuff handled by our anniversary, which is Saturday (Yay us!!!). 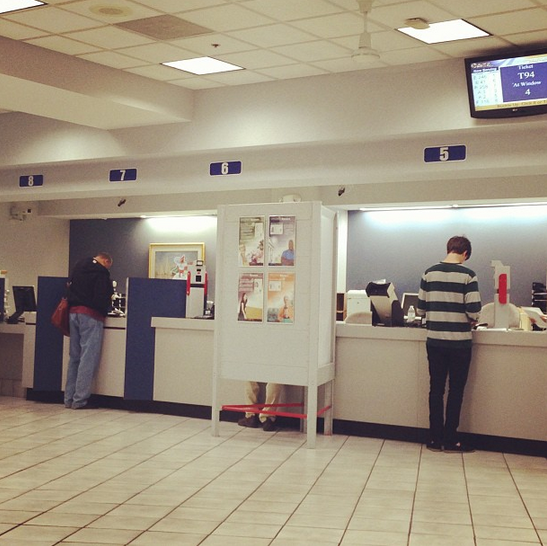 I legally changed it with the Social Security office in late April, and I changed my driver's license last Friday. This is what my Friday afternoon looked like last week. 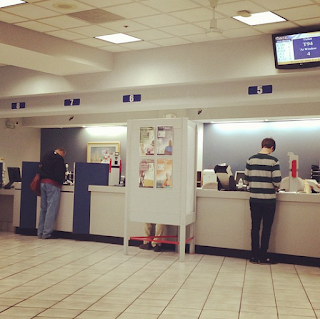 I spent the afternoon at the DMV. When I first changed my name at the Social Security office, I think my husband was more in shock than I was. I had made peace with changing my last name a long time ago. I'd been using his last name since we'd gotten married anyway. I decided to keep my maiden name as my middle name, dropped my former middle name, and took my husband's name. No hyphen; no judgement about anyone that hyphenates. I just didn't feel the need for it. I kept my maiden name as a nod to my folks. There are no boys in our family. I also kept my maiden name because I'll be damned if it's not I really want it on my doctoral degree. I find it so interesting how others feel the need to weigh in on how you choose to name yourself. I can argue all the sides: hypen, no hyphen, keeping your maiden name, dropping it and taking his name only. I just made a decision that works for me. Honestly, it took me almost a year to change my last name because the process is SOOOOO involved. I'd heard this from other newly-married women. As a matter of fact, I know some who still haven't gotten around to making any legal name changes. As I go through this process, I've come to a place where I believe that husbands should have to file all paperwork, wait in all of the lines, and call all creditors, banks, etc. to straighten out the name change stuff. Typing that sentence just reminded me that I have yet to tackle the bank, my creditors, my rental property. . . Lord help me!!! I just got overwhelmed again. However, I'm doing it for love, so it's all worth it! My last name isn't the only change. I originally called this blog "Paper Writing and Surviving: On Newlywed life, Academia, yadda, yadda, yadda." I was looking at the banner at the top of the blog the other day, and thought, "Self, you're not just writing and surviving. Girl, you are thriving!" That epiphany made me decide to change the name of the blog. Check out the banner and the new name, "Writing, Surviving, & Thriving: Yadda, yadda, . . . " The new blog name is a reminder to myself, and anyone else who needs it, to keep chasing the light at the end of the tunnel. Keep surviving and thriving, yall! So I'm off to tackle revisions to my methodology chapter :-/. I just keep reminding myself that every keystroke gets me closer to breaking free from the dissertation chains. Keep lifting me up and I'll do the same. Until next time . . . I'll be over here writing, surviving, & thriving under my new name. I like the blog name change. Kudos to you for getting it the legal stuff done re your name!!! I added my husband's name to my last name with no hyphen. It was the right decision for us and yup, I feel you on the amount of commentary random folks had on it. LOL! As our boy Jay-Z would say, Can I live???? Hi there! So glad to hear from you! I'm crying laughing at "Can I live???" Outside of my husband and maybe my parents, I don't know why anyone else would care. I got an earful from a few "hyphenaters." LOL. To each his own.